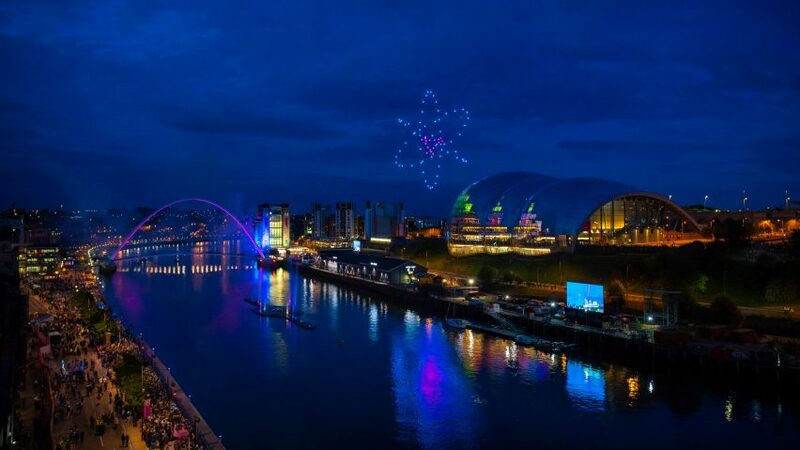 One hundred drones flew in formation through the night sky to electronic music last week at the opening of Great Exhibition of the North in Newcastle, England. Leeds-based creative studio Newsubstance orchestrated the autonomously flown, swarm drone performance which featured one hundred drones made by Singaporean company Skymagic. Equipped with colour-changing LEDs, the drones flew across the night sky to a track written and produced by electronic duo Darkstar that explores the notion of home. Skymagic's choreography drew upon on the region's heritage by flying in formation to create motifs such as the North Star. The performance marked the beginning of a joint venture between the two companies as Skymagic becomes Newsubstance's exclusive performance drone offer. With offices in Europe and Asia, Skymagic specialises in large scale drone-based light shows across the globe. "Drone technology is now an established field and in recent years its use in creating aerial displays at large-scale ceremonies and live events has become more prevalent," Skymagic's director Patrick O'Mahony told Dezeen. "While many of these performances have, on some level, been designed as a showcase or platform for tech giants, the work of Skymagic is different," continued O'Mahony. "Unlike any of the other companies out there, the team at Skymagic - through its newly formed joint venture with Newsubstance – is able to draw on a rich heritage of technological development, live entertainment experience and performance design." "This unique skillset within the team allows us to lead the design and development of the creative rather than simply placing a logo in the sky," said O'Mahony. "We understand the show design vernacular and our creative response demonstrates this, telling stories in the sky that always speak to the show and are not just about us and our technology. The show is king." "Another point of difference is our mantra that it is not simply about the number of drones in the sky but more importantly the narrative and the number of drones best deployed to represent this," he added. "Creativity is key rather than a race to break another world record. That said, it is important to state that our super stable system is, however, scalable with no limitation on airborne fleet size." Skymagic said that special effects, cladding, closer proximity flying, longer flight times, and more robust weather resistance are some of the elements that its team of internal software developers and engineers are currently focusing on. "Drone technology is constantly evolving in what is a fast-paced environment," said O'Mahony. "Every day we see new advances in GPS accuracy, battery technology and system efficiencies – amongst other things. Our R&D team is constantly working to utilise and incorporate these advancements in industry technology." Hosted in Newcastle, Gateshead, Great Exhibition of the North is a free event that aims to tell the story of the North of England and its innovators, businesses, artists and designers. The event takes place across one of three venues – Great North Museum, BALTIC Centre for Contemporary Art or Sage Gateshead, which will host an 80-day programme of exhibitions and events." Other drone-based performances include a show at last year's Design Miami event by Amsterdam-based Studio Drift, which choreographed 300 drones to mimic a flock of birds over the beach. Dezeen's drone documentary Elevation is currently being screened at festivals around the world including in Australia, Kosovo, Pristina and Madrid. The 18-minute film explores how drones will change architecture, cities and society.